If you are a small scaler, or if you have a child's room in 1/12 scale, this is a lovely project. 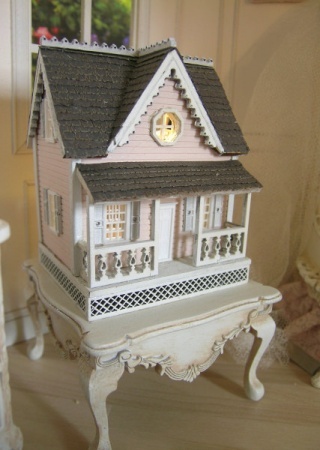 Of course, it was specifically designed to coordinate with all of the pieces in Madalyn's Nursery. But I am also offering the doll house/table project as a stand alone class. 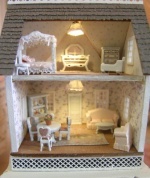 You will construct the doll house, including doing your own wiring. You will do all finishes and trims, wallpaper and make the furniture. The house is designed to sit on it's special table. As a matter of fact, the battery and on/off switch are hidden below the table, so this is a freestanding project.NOTE: THE TABLE KIT IS ALSO INCLUDED! I've kept the furniture simple in construction, but think it's still cute as can be! If you have been thinking you might like to try your hand at the small scales, here is the perfect project. The furniture in this project is smaller than the pieces I used in the baby house. 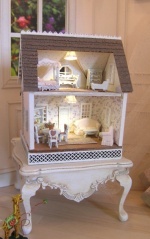 This project is done in 144th scale to fit in the nursery setting. Your kit includes laser cut pieces, paints, all lighting components, shingles, wallpapers, furniture kits, rugs, and table kit. Everything you see in the photo is included. You will need to supply acrylic paints, spray sealer, paint brushes, X-acto knife, small pliers, tweezers, and glue. A complete supply list will be sent out prior to the kit delivery. 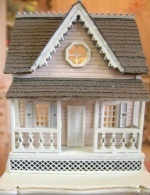 Kits for Madalyn's doll house will be available to ship mid April. Complete instructions and photos will be provided in an extensive online tutorial.